Today I suddenly had the urge to browse through my past travels and I realize how much I miss travelling. I haven't gone anywhere in almost two years, except perhaps my hometown, which doesn't really count as travelling. Sigh. Even if I know travelling with a baby in tow is doable, I think it's just too much of a hassle, you know? Travelling is tiring as it is. And I'm complicating it by tagging along a tot. I don't know why I posed like this. This is Niagara Falls, by the way. Canada side. I am so happy that Lex is finally entering toddlerhood in a few months. That means he can eat anything (well, almost anything..) adults can eat! That's one less hassle ticked off the list. Time to start planning! At Lake Louise with my Papa and Ate. I don't want to get overboard and plan something radical. Pacing is the key. 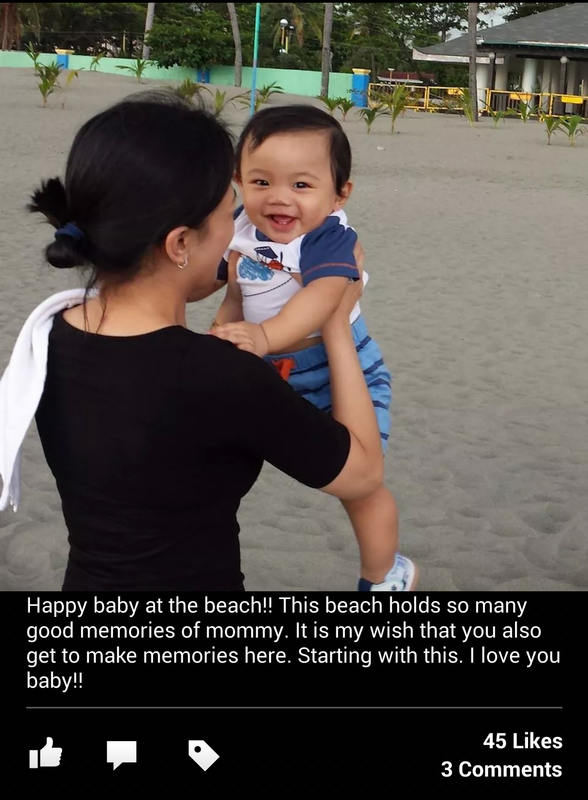 When Lex and I vacayed in Dagupan last month, I saw that my travelling tot can adapt pretty much easily to his environment. That's a good thing. Drinking apple cider on a cold, cold morning. First time to taste one and I must say, that drink's got spice! I like it! Another exhausting thing about travelling with a baby is the planning. When we went to Dagupan, I had to plan everything: what he'll do, what he'll eat, where he'll stay during the day. And his stuff. Sigh. He's got more stuff than I do. Food pa lang. I had to bring our own food coz I feed only organic vegetables to Lex. Then there's his booster seat, floor mat, sterilizer, distilled water, and travel bather. 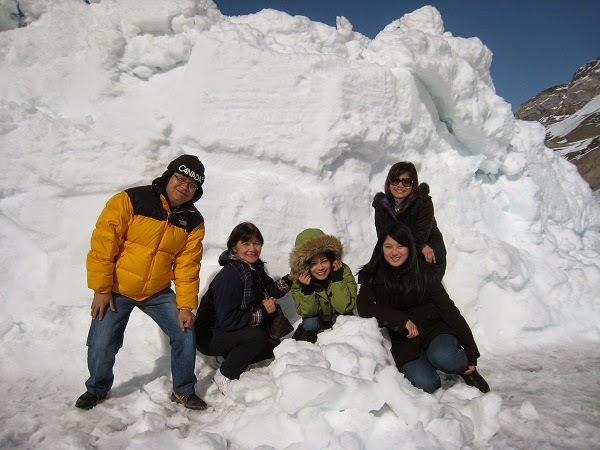 At the Columbian Icefields with my family and cousin. I just noticed that in most of my pictures, I'm wearing the same blasted North Face jacket. I should have planned my wardrobe better. Ok, note to self. What is really rewarding though is the fact that despite all the planning and the hassle and exhaustion that comes with travelling with a baby, there is something priceless in return: memories. Memories that my baby may not remember at this point in his life, but hey, it's not just his memory bank I'm building up. It's mine too. It is the experience that will live forever in my mind. And the knowledge that I know for myself that while my child is young, I did not miss out on anything. It's amazing how memories can be immortalized by pictures. One day when he's all grown up, he can look at his pictures and say, "Dad, Mom, thanks for giving me a happy childhood." To which we will reply, "No, Lex, thank YOU for giving us a happy life!" Dalhin mo na lang. Mahirap na baka magkasakit pa si Rhian if hindi sterilized yung mga eating gadgets niya. If too bulky, may nabibiling microwave steam sterlizer. Mas handy yun pang-travel. Although kailangan may microwave yung tutuluyan niyo para magamit mo. Not to mention, kung wala ka pa nun ngayon, bibili ka pa. So gastos ulit. Hayayay. Waahhh.. gastos nga yun. Ang next problem ko naman is yung sterilizer ni Rhian is 110 volts, galing US.. Huhu. Dapat maplan namin kung pano gagawin namin, 4 days pa naman yun and hindi naman pwedeng hindi i sterilize yung mga bote and utensils nya. Waahhh..
Bili ka na lang ng transformer. Meron yun sa mga True Value stores, i think. I used to travel too before I got married and had a baby. Thankfully my son's big na, he's now 3; so we started travelling with him when he was at least a year old. Pag may baby na andaming bitbit and considerations when you plan for your vacation. Di na pwede yung come-what-may and backpacker approach! True! Parang lahat talaga dapat isipin. As in LAHAT! I miss travelling too. I am a travel junkie. Pre-pregnancy, I make sure to have atleast 2 travels per year. Pero this year, waley na waley. Although last year kahit 4 months preggy ako, nag Palawan padin ako. Hehehehe! :) I am excited to travel with the baby too. Pero siguro mas less kami sa dadalhin kasi I breastfeed my baby. And we use stainless stuff na no need to strilize. :) You could try that too. Para travel ready. Brilliant! Oo nga no, use stainless. Why didn't i think of that? Thanks so much for this advice!